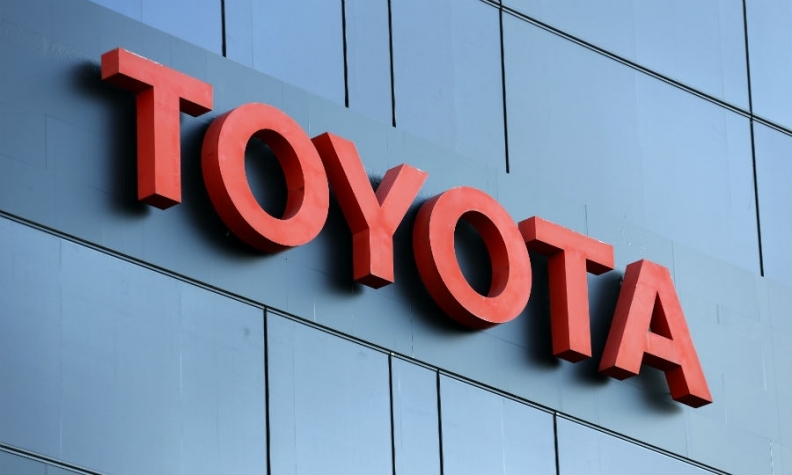 TOKYO -- Booming North America powered Toyota Motor Corp. to a double-digit operating profit increase in the October-December quarter even as sales shrank in every other major market. Citing higher expectations for U.S. sales, as well as advantageous foreign exchange rates, the world’s biggest automaker raised profit and revenue forecasts to new record levels, with the Japanese yen weakening faster than anticipated. Net income jumped 14 percent to 600.03 billion yen ($5.00 billion) in the company’s fiscal third quarter ended Dec. 31, compared with 525.46 billion yen ($4.38 billion) a year earlier, the company said today. Operating profit rose 27 percent to 762.88 billion yen ($6.36 billion), from 600.51 billion yen ($5.01 billion). Global revenue grew 8.9 percent to 7.170 trillion yen ($59.78 billion) in the period, despite global vehicle sales falling 2.3 percent to 2.263 million units. Robust demand in the U.S. also helped. “The U.S. remains very strong,” Sasaki said. Toyota expects the bigger profit even though it trimmed its full-year sales outlook for the second time this fiscal year because of worsening demand in Japan, Asia and Europe. It now expects to sell 9.0 million vehicles in the current fiscal year ending March 31, 2015. That represents a decline from the record 9.116 million it sold the previous year. It had originally projected sales of 9.1 million vehicles and later scaled that back to 9.05 million units in November. Sasaki said other factors, including aggressive cost cutting, also contributed to the quarterly profit jump. Big sales gains in North America also offset declines elsewhere. North America was Toyota’s only bright spot, the sole region reporting a year-on-year sales increase. Sales in Toyota’s biggest market advanced 7.2 percent to 712,000 vehicles, as volume fell in every other region. North America’s regional operating profit surged 37 percent to 167.9 billion yen ($1.40 billion) in the quarter, from a year earlier. Sales in Europe slid 1.3 percent to 220,000 vehicles, even as regional operating profit there nearly doubled to 33.2 billion yen ($276.8 million), mainly through cost-reduction campaigns. Toyota cut its sales outlooks for Japan, Europe and Asia. In its European markets, the company now expects to sell 840,000 vehicles in the current fiscal year. That’s down from the 844,000 units it sold last year and compares with an earlier goal of 870,000 vehicles. Despite the lackluster sales forecast, Toyota still expects to ride the retreating yen to a second year of record earnings. Net income is now expected to be 2.13 trillion yen ($17.76 billion) in the current fiscal year, up from a record 1.823 trillion yen ($15.20 billion) in the year ended March 31, 2014. In November, it forecast net income would increase to 2 trillion yen ($16.68 billion). Operating profit is expected to climb to a record 2.70 trillion yen ($22.52 billion), from the previous all-time high of 2.292 trillion yen ($19.11 billion) booked in the last fiscal year. In November, it predicted 2.5 trillion yen ($20.85 billion). Revenue is expected to advance to 27 trillion yen ($225.13 billion) this year, just topping the previous record revenue of 26.289 trillion yen ($219.20 billion) logged in the fiscal year ended March 31, 2008, before the financial crisis.